Due to Facebook (pro-)active blocking of LetItPlay official page we are changing airdrop conditions. We won’t restore our Facebook page, instead we are increasing amount of tokens for Twitter and Telegram subscriptions. So all registered in LetItPlay EOS holders will get up to 1000 PLAY tokens. To receive Free Play tokens you should register your ETH address* with EOS tokens in LetItPlay investor panel. You will get 500 PLAY tokens if your ETH address contains at least 1 EOS token on the June 1st, 2018 when the last EOS distribution period finishes. The snapshot for the airdrop will be taken immediately at the end of EOS Token distribution period 350 – on June 1th, 2018. There will be a number of checks and tests until June 15th, 2018. 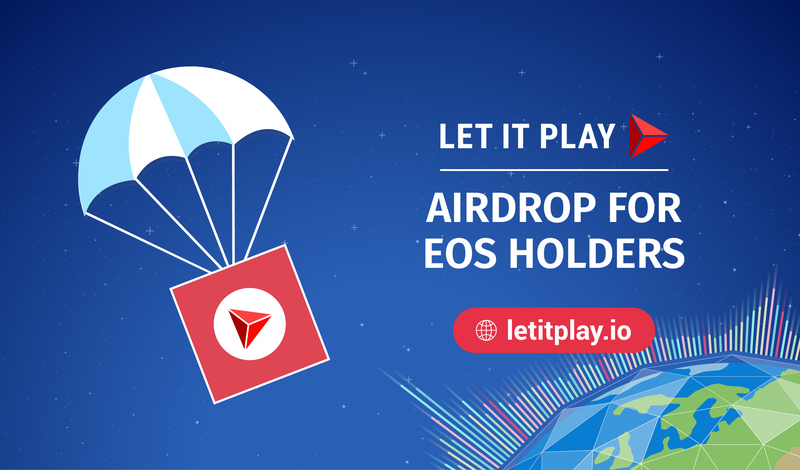 And after LetItPlay tokensale will be successfully finished all the PLAY tokens wil be delivered to registred in LetItPlay EOS holders. *Enter only ETH address for which you own the private key. Do not register ETH from an Exchange. If you register an exchange account, your PLAY tokens will be allocated to the exchange's ETH account and you may never receive or be able to recover your PLAY tokens. Hi, i cant register my eth address as the page is not loading. Any preferred browser? I am using chrome. Now it should be ok. Try again please. Doesn't work. I will try a different browser later. How can I get PLAY tokens if I subscribe the official Steemit or Telegram. ?